This ergonomic ceramic bowl is specially designed for maximum couch-eating comfort and convenience. 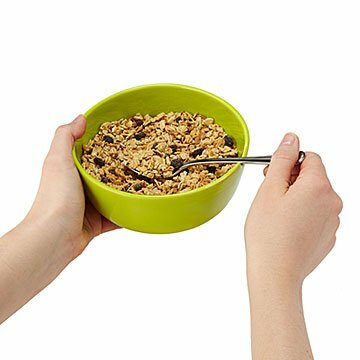 This ergonomic ceramic bowl is specially designed by Thomas Both for maximum couch-eating comfort and convenience: It fits easily in your hand in various holding positions, and an indent in the base gives fingers extra grip and balance. The notch on the side provides a place for your thumb and also stabilizes your spoon, leaving the other hand free for the crucial remote control maneuvers. When settling in for some serious TV watching, always come prepared with the proper snacking equipment. Choose from either a set of warm orange and yellow, or cool lime and indigo. Made by a team of artisans in Mexico. Learn more about how Thomas is taking "comfort food" to the next level in an interview on the blog. This ergonomic ceramic bowl is specially designed by Thomas Both for maximum couch-eating comfort and convenience: It fits easily in your hand in various holding positions, and an indent in the base gives fingers extra grip and balance. The notch on the side provides a place for your thumb and also stabilizes your spoon, leaving the other hand free for the crucial remote control maneuvers. When settling in for some serious TV watching, always come prepared with the proper snacking equipment. There's one place—and only one place—where you'll find the Couch Bowl: UncommonGoods. Use mostly for cereal so far. Can carry a bowl now without feeling like a circus balancing act!! Love these!! Easy to hold but hard to eat last bites. When down to the remaining cereal/soup it was a hassle fishing around the bump to scoop up last bites. Both of my adult sons will be using this several times a week. No more accidents on the couch. Every day for breakfast and lunch,supper for side dishes.